A few years ago, my daughter requested that her nightly lullaby be replaced with a bedtime story. I was happy to comply, and promptly invented stories full of imaginary creatures in elaborate plots intended to convey some important lesson about patience or hard work or being kind to others. But my daughter was not pleased. She had very particular ideas about what her bedtime stories should be about. She wanted stories about a little girl planning a birthday party. A human girl. A human girl about her age. And what fascinated her were the mundane details: the theme for the party, the location, who was invited, and (most importantly) what they had for dessert. It turns out my daughter is not alone. Her passion for birthday party stories, in particular, may be somewhat idiosyncratic, but children often prefer the factual over the fantastical. And a growing body of work suggests that when it comes to storybooks, they also learn better from stories that are realistic. For example, preschool-aged children are more likely to learn new facts about animals when the animals are portrayed realistically as opposed to anthropomorphically, and they're more likely to apply the solution to a problem presented in a storybook to a new scenario when the storybook involves real people (as opposed to fictional characters) and a realistic plot (as opposed to a space adventure). A new study by Nicole Larson, Kang Lee, and Patricia Ganea, forthcoming in the journal Developmental Science, reveals that learning about good behavior is no exception. 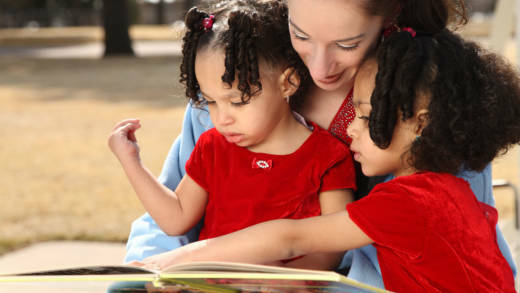 When children read a realistic storybook about humans who shared, they were more likely to do so themselves. In the study, 4- to 6-year-old children were read a story about sharing that featured either human characters or anthropomorphic animals. Both before and after the story, children had the opportunity to share stickers with other children. The number of stickers each child set aside for others provided a quantifiable measure of sharing. The key finding was that, on average, children who heard the story featuring a human who shared increased the number of stickers they shared, whereas those who heard the story featuring an anthropomorphic animal that shared did not. In other words, young children applied the lesson from the story to their own behavior, but only when the story featured humans. The researchers also found that when children in another group were allowed to choose whether to read the story about humans or the story about anthropomorphic animals, they had no reliable preference. This suggests that the story about humans wasn't more effective in promoting sharing simply because children found it more appealing, and also that children weren't reliably drawn to the more fantastical alternative. The findings from the study reinforce the idea that young children have an easier time exporting what they learn from a fictional storybook to the real world when the storybook is realistic. The leap from a fictional human to a real one is simply smaller than the leap from an anthropomorphic raccoon to a human. But it could be that as children grow older they become better at making these leaps, or that parents can help them make the leaps more readily. In a paper just published in the journal Cognition, for example, developmental psychologist Caren Walker and I found that prompting 5- and 6-year-old children to explain key events in a storybook made them better at extracting the moral of the story and then applying it to a real-world problem. This is something parents can do easily as they read storybooks with their children, asking them why (say) an anthropomorphic raccoon did or didn't share, and why other characters responded as they did. If the theory in our paper is right, this should help children relate the unrealistic aspects of the story to what they know about the real world, and thus appreciate the patterns that hold across both the fictional world of the story and the real world around them. The lesson I've learned from research on children's stories is this: When my daughter asks for a (realistic) birthday party story tonight, I'll indulge her. It will be about a human girl who celebrates her 7th birthday. But it will also include some realistic problems with realistic solutions — and I'll throw in some lessons about sharing and some prompts to explain for good measure.